Stein Plastic Surgery, in Raleigh, NC, combines luxury and a state-of-the-art surgical facility in a contemporary and serene office setting designed to offer patients the utmost in personal comfort as well as aesthetics. You deserve a peaceful, private and comfortable location in which to see the doctor, have surgery, recover and be attended to. You will not find more comfortable surroundings anywhere. Our center features a state-of-the-art Surgical Facility where all procedures can be performed in complete privacy. Our facility is furnished with the latest modern equipment and instruments for your utmost safety and comfort. 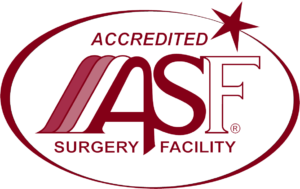 Our surgical suite is accredited by AAAASF, the American Association for Accreditation of Ambulatory Surgery Facilities. You can count on Dr. Stein to give you a valid, medical opinion of possible results and know that he has the skill and artistry to achieve those results. We believe you should be shown actual results. We are open Monday – Friday from 8 a.m. to 5 p.m.
We are located at 4301 Lake Boone Trail, Ste. 309, Raleigh NC 27607.